Amy Winehouse - much can be said about the late Amy Winehouse, one of the U.K.'s flagship vocalists during the 2000s. The British press and tabloids seemed to focus on her rowdy behavior, heavy consumption of alcohol, and tragic end, but fans and critics alike embraced her rugged charm, brash sense of humor, and distinctively soulful and jazzy vocals. Her platinum-selling breakthrough album, Frank (2003), elicited comparisons ranging from Billie Holiday and Sarah Vaughan to Macy Gray and Lauryn Hill. Interestingly enough, despite her strong cockney accent and vernacular, one can often hear aspects of each of those singers' vocal repertoire in Winehouse's own voice. Nonetheless, her allure had always been her songwriting -- almost always deeply personal but best known for its profanity and brutal candor. Born to a taxi-driving father and a pharmacist mother, Winehouse grew up in the Southgate area of northern London. Her upbringing was surrounded by jazz. Many of the uncles on her mother's side were professional jazz musicians, and even her paternal grandmother was romantically involved with British jazz legend Ronnie Scott at one time. While at home, she listened to and absorbed her parents' selection of greats: Dinah Washington, Ella Fitzgerald, and Frank Sinatra among others. However, in her teens, she was drawn to the rebellious spirit of TLC, Salt-N-Pepa, and other American R&B and hip-hop acts of the time. At the age of 16, after she had been expelled from London's Sylvia Young Theatre School, she caught her first break when pop singer Tyler James, a schoolmate and close friend, passed on her demo tape to his A&R, who was searching for a jazz vocalist. That opportunity led to her recording contract with Island Records. By the end of 2003, when she was 20 years old, Island had released her debut album, Frank. 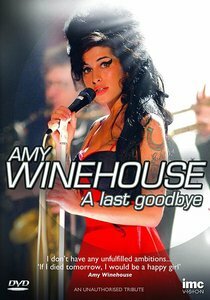 With contributions from hip-hop producer/keyboardist Salaam Remi, Winehouse's amalgam of jazz, pop, soul, and hip-hop received rave reviews. The album was nominated for the 2004 Mercury Music Prize as well as two Brit awards, and its lead single, "Stronger Than Me," won an Ivor Novello Award for Best Contemporary Song. Following Winehouse's debut, the accolades and inquiring interviews appeared concurrently in the press with her tempestuous public life. Several times she showed up to her club or TV performances too drunk to sing a whole set. In 2006, her management company finally suggested that she enter rehab for alcohol abuse, but instead, she dumped the company and transcribed the ordeal into the U.K. Top Ten hit "Rehab," the lead single for her second, critically acclaimed album, Back to Black. Containing evocative productions from Salaam Remi and British DJ/multi-instrumentalist Mark Ronson, the album somewhat abandoned jazz, delving into the sounds of '50s/'60s-era girl group harmonies, rock & roll, and soul. The fanfare over the release was so great that it started to spill over onto U.S. shores; several rappers and DJs made their own remixes of various songs, not to mention covers by Prince and the Arctic Monkeys. One month after Winehouse won Best Female Artist at the Brit Awards in February 2007, Universal released Back to Black in the U.S. The LP charted higher than any other American debut by a British female recording artist before it, and it remained in the Top Ten for several months, selling a million copies by the end of that summer. Just as in the U.K., she became the talk of the town, landing on the covers of Rolling Stone and Spin magazines. Not long afterward, though, Winehouse canceled her North American tour. Early reports revealed that she was entering rehab for alcohol and drug addiction, but her new management denied the claims, stating it was due to severe exhaustion. Her erratic behavior kept her and her new husband, Blake Fielder-Civil, in the tabloids constantly, and on and off stages on both sides of the Atlantic, but in late 2007, American fans were finally given a chance to hear Winehouse's early work, with a slightly abbreviated (two songs removed and one added) version of Frank. The next few years would be filled with drama, disappointment, and very little music. By 2009, her marriage had ended in divorce, she had repeatedly been arrested on assault charges and/or public order offenses, and her struggles with substance abuse and mental health issues tragically played out in the press. Public performances had turned into incoherent disasters, the worst of them posted to video sharing sites for all to see. A track on the Quincy Jones tribute Q: Soul Bossa Nostra would appear in 2010, while a duet with Tony Bennett was announced in early 2011, but a planned follow-up to Back to Black would never make it past the demo stage. Winehouse was found dead in her Camden, London apartment on July 23, 2011. An investigation to determine the cause of death was announced soon after.